Twice a year, we gather here to honor our military veterans – On Memorial Day at the end of May, and on Veterans Day on November 11. Of these two days, Memorial Day – originally known as “Decoration Day” for decorating the graves of those who died in war — goes back the farthest, to the waning days of the Civil War. 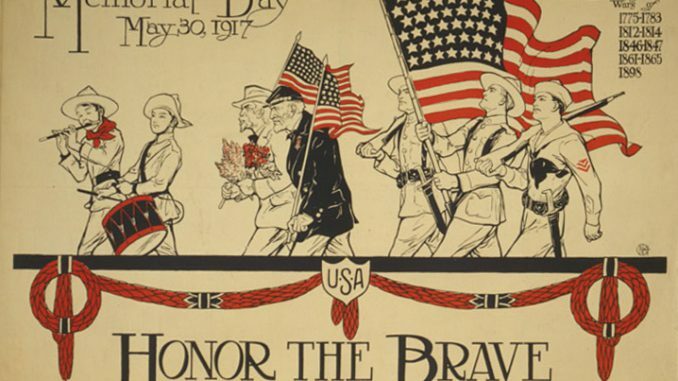 There are many claims for the origination of Decoration Day – most of them probably accurate – for there were organized efforts in many towns and cities around the country, both North and South, to honor those who gave their lives in that most destructive of wars, in which over 600,000 Americans died, far exceeding the number killed in any war since. —Warrenton, Va. says that the first Civil War grave ever decorated was there, on July 3, 1861. —Charleston, S.C. also has a plausible claim. During the war, the Charleston Race Course served as a prison camp; over 250 Union prisoners were buried there in unmarked graves. Black residents of Charleston, along with teachers and missionaries, cleaned up the burial ground and erected an arch with the inscription, “Martyrs of the Race Course.” Nearly 10,000 people attended the commemoration on May 1, 1865, and most brought flowers; the event was reported in the New York Tribune and other national papers. By 1866, a number of observances took place, including Macon and Columbus, Ga., and Richmond, Va., and Carbondale, Ill. From Columbus, Georgia, the Ladies Memorial Association invited the ladies of every Southern state to join them in honoring the Confederate dead on April 26. One such event, often cited, was in Columbus, Mississippi, where women placed flowers on the graves of the Confederate dead; and seeing the graves of Union soldiers neglected, they placed flowers there also. The 30th day of May, 1868, is designated for the purpose of strewing with flowers or otherwise decorating the graves of comrades who died in defense of their country during the late rebellion, and whose bodies now lie in almost every city, village, and hamlet church-yard in the land. In this observance no form of ceremony is prescribed, but posts and comrades will in their own way arrange such fitting services and testimonials of respect as circumstances may permit…. We should guard their graves with sacred vigilance. All that the consecrated wealth and taste of the nation can add to their adornment and security is but a fitting tribute to the memory of her slain defenders. Let no wanton foot tread rudely on such hallowed grounds. Let pleasant paths invite the coming and going of reverent visitors and fond mourners. Let no vandalism of avarice or neglect, no ravages of time testify to the present or to the coming generations that we have forgotten as a people the cost of a free and undivided republic. Let us, then, at the time appointed gather around their sacred remains and garland the passionless mounds above them with the choicest flowers of spring-time; let us raise above them the dear old flag they saved from dishonor; let us in this solemn presence renew our pledges to aid and assist those whom they have left among us a sacred charge upon a nation’s gratitude, the soldier’s and sailor’s widow and orphan…. Gen. Logan was also a U.S. Congressman from Illinois, and he introduced a bill in Congress, proposing to set aside May 30 of each year as Decoration Day. That May 30, 1868, saw the first large-scale observance of Decoration Day, with ceremonies held at 183 cemeteries in 27 states. The largest ceremony was held at Arlington National Cemetery, with about 5000 people attending. American flags were placed on all veterans’ graves –the same as today. Various Washington officials, including General and Mrs. Ulysses Grant, and General James Garfield, presided over the Arlington ceremonies. After the speeches, children from the Soldiers’ and Sailors’ Orphan Home and members of the GAR made their way through the cemetery, spreading flowers on the 20,000 graves, both Union and Confederate, and singing hymns and reciting prayers. By the end of the 19th century, Decoration Day ceremonies were being held on May 30, throughout the Nation. Many state legislatures passed proclamations designating the day as Memorial Day, as it became known over time. After World War I, it was broadened to include those who died in all U.S. wars. In 1971, the date for commemorating Memorial Day was changed to the last Monday in May, in order to create a three-day weekend. For many years, one of the largest Decoration Day ceremonies in the nation, was held in Lovettsville, at the Lovettsville Union cemetery. We have one description, from 1898, describing “services in memory of the dead” held at New Jerusalem Lutheran Church, but organized by the Union Cemetery Co.
“An ideal day, a beautiful cemetery, a very large attendance, appropriate music and addresses, with a profusion of flowers, made the occasion memorable. It was a gathering from different states, where heart touched heart, and hand touched hand.” Five pastors took part. The Decoration Day ceremonies took place here for many decades at Union Cemetery. Our own Elaine Walker recalls, as a “Flower Girl” dressed in white, joining others in strewing flowers over the graves in the 1940s, up to 1950. I would urge you to visit our local cemeteries. At the larger cemeteries, Reformed (St. James), the old Lutheran, and Union cemetery, all veterans’ graves are marked with flags, so they are easy to find. —New Jerusalem: unique – at least six Revolutionary War veterans, four War of 1812, perhaps half a dozen Civil War. —Reformed: about a dozen veterans, mostly Civil War, but some as recent as WWII. —Union Cemetery: over 250 veterans of all wars, all marked with flags by the Trustees, and many with flowers. Behind every one of these, is a story. Most poignant are those who were cut down in their youth, serving in the nation’s wars. The easiest to see, are those from our nation’s 20th century wars, where you can see the date of death as 1918, 1944, and so forth. As we honor those who gave, in Lincoln’s memorable words, “the last full measure of devotion,” I would urge you to get to know some of these local heroes. I and others can help you learn more about them. One of the best ways to honor their memory, is to learn who they were, what they did, and how they served and died — so that we may live as we do today.